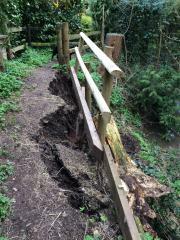 Cradley and Storridge parish council wish to alert the public to the fact that the public footpath running from The Old Post Office to Churchstile Farm field and footbridge has collapsed by Chapters. The council have put up signs saying that the path is closed and the Locality Steward will be putting up further signs and tapping off the area temporarily until Balfour Beatty can repair it. 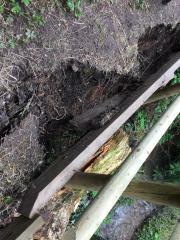 Please do not use this footpath until it has been properly repaired.